Sixteen metres of tulle. A creation by Megan Canning Designs. Image: Martin Ollman. You could feel their hearts beat. The hearts, that is, of the models wearing voluminous, long gowns at FASHFEST last Friday night (19 Oct). 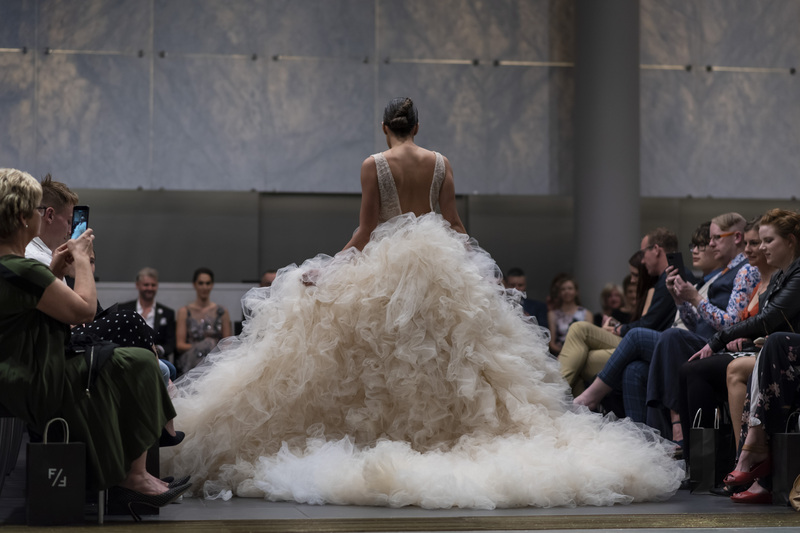 They weren’t just wearing magnificent pieces, they were wearing them while on the long, moving escalators in the foyer of the National Gallery that formed part of the overall runway. How tricky was it? Consider this. One gown was created with a whopping 150 metres of tulle. Would the fabric get caught? It didn’t and the show was nothing short of majestic. Model: Kahu Kapea from HAUS Models. FASHFEST is ‘changing it up’ and this was its first full show at a cultural institution. The event sold out, with VIP seats going first. Even the standing room upstairs at the top of the escalator was packed with guests staring down over the models for a very different perspective indeed. The event started with Megan Canning Designs, with the showstopper, 16-metre tulle gown. 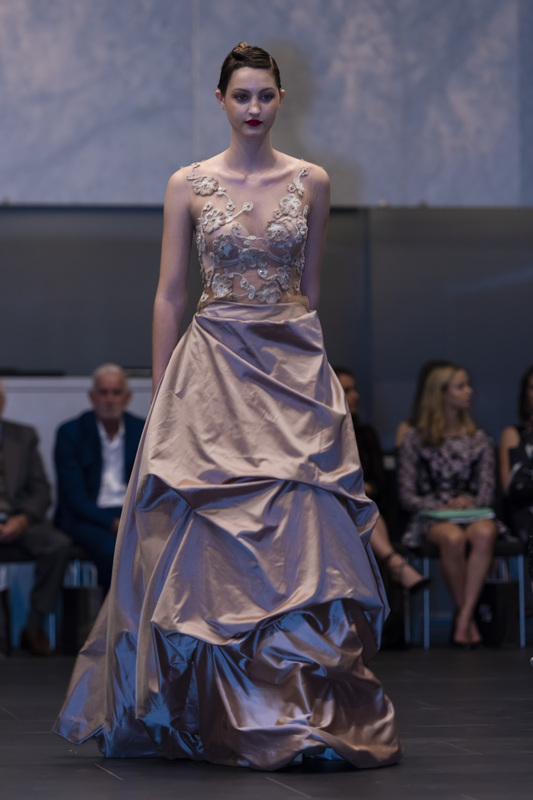 It was breathtaking watching model Kahu Kapea, from HAUS Models, manage the gown while walking to the cool tunes of zares, Canberra DJ and electronic dance producer. And it wasn’t just Kahu who had to manage massive mounds of fabric. Many other models did too. Super model Anneliese Seubert (l) with young designer Charly Thorn, walking the finale. Next up was the evening luxe collection by young designer Charly Thorn, with legendary model Anneliese Seubert modelling an elegant long silk dress which Charly has fondly called the ‘Anneliese Dress’. Charly designed the bold black and white pattern, called ‘stargaze’, and had it printed in Sydney. Some solid pieces in the collection were made from wool and they all popped—pinks, yellows, greens and blues. Charly Thorn’s new collection pops with colour. Last, but not least, appeared the collection by Hajar Gala Couture, each piece exquisitely detailed. This is true couture. It takes ages for Hajar to design, fit and make each of her luxury gowns. Hajar Gala Couture. Image: Martin Ollman. 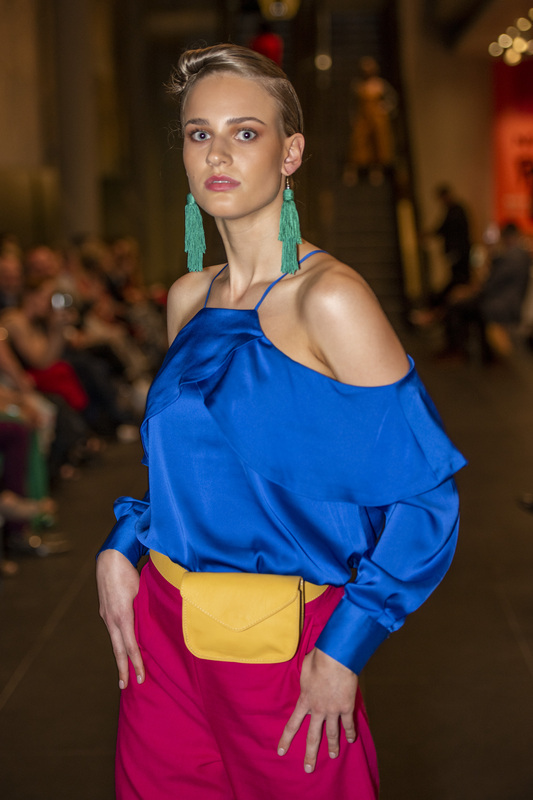 Pre-show, guests gathered upstairs for a ‘Quandong Paint Cocktail’, created by Archie Rose for FASHFEST and inspired by Lichtenstein’s brushstrokes. 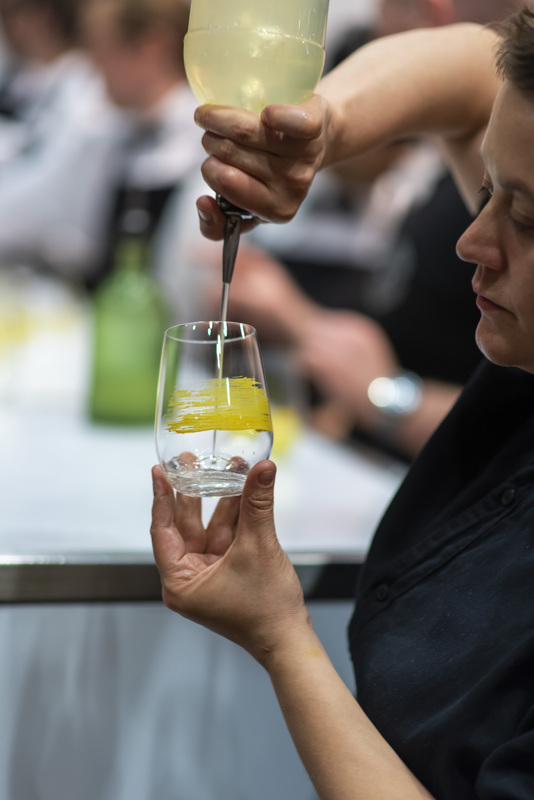 As soon as the drink is swirled, the Quandong Paint leeches into it, changing the flavor from a simple gin old fashioned into a native peachy delight. 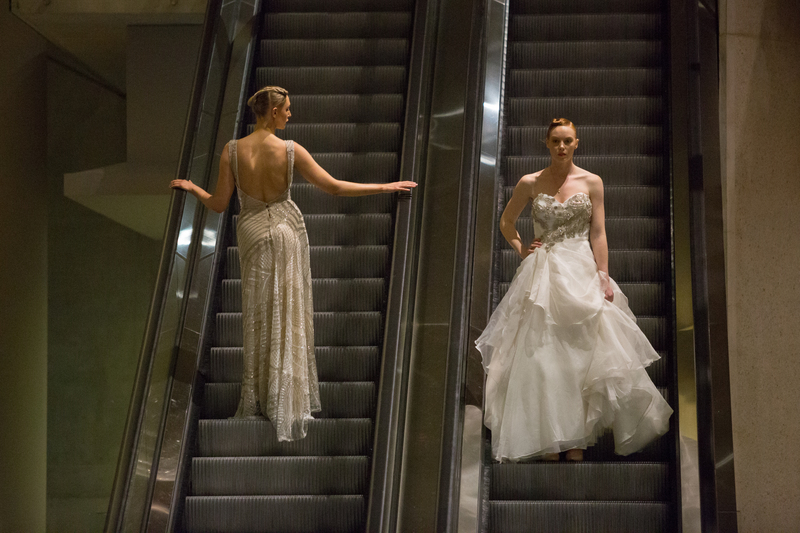 Models gracing moving escalators–a tricky business indeed, says FASHFEST’s Andrea Hutchinson. Image: Jack Mohr. 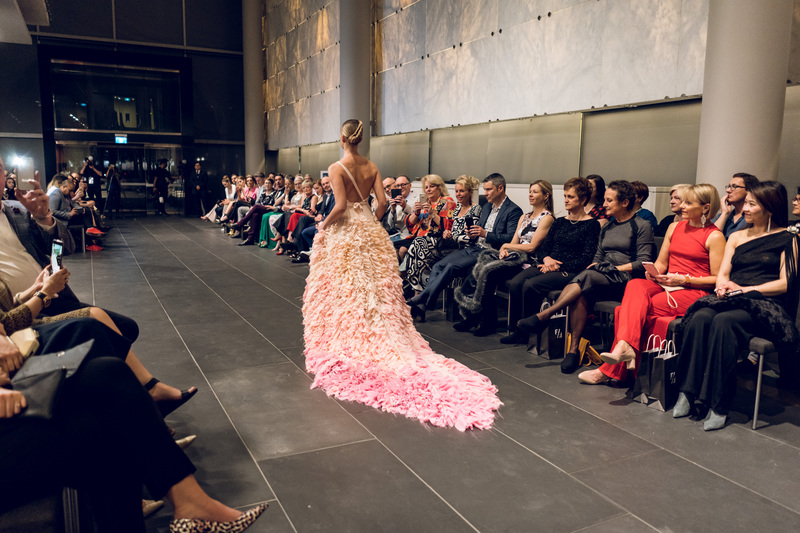 Pre and post-show, guests were entertained by Simon Anau while getting up close to a small exhibition of gowns by the three designers, to see just how much work goes into each one. The National Gallery of Australia was a magnificent backdrop for the first ‘change it up’ event for FASHFEST. So what’s next? 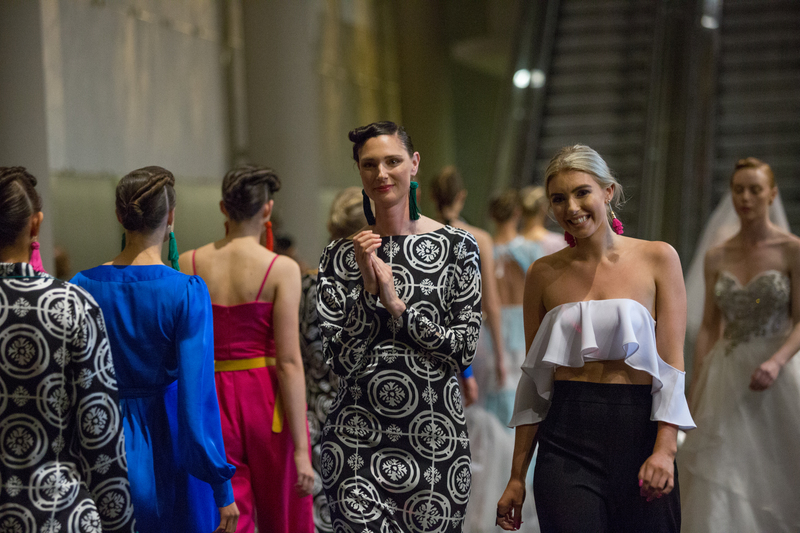 Clint Hutchinson says planning is well underway for the next major FASHFEST event in December and Canberrans might just see FASHFEST pop up in-between. The Quandong Paint Cocktail created for FASHFEST by Archie Rose. Image: Martin Ollman. Models from Devojka Models, Victoria’s Models and HAUS Models. Hair for the event led by Craig Rhodes using Sachajuan. MUA was led by Katie Saarikko, using Harlotte Cosmetics. The FASHFEST photography team is led by Leighton Hutchinson Photography. This entry was posted in LFW Style and tagged Andrea Hutchinson, Anneliese Seubert, Archie Rose, Charly Thorn, Clint Hutchinson, Craig Rhodes, Devojka Models, FashFest, Hajar Galar Couture, Harlotte Cosmetics, HAUS Models, Jack Mohr, Katie Saakkiro, Martin Ollman, National Gallery of Australia, Victoria's Models on October 22, 2018 by gracienumber1.